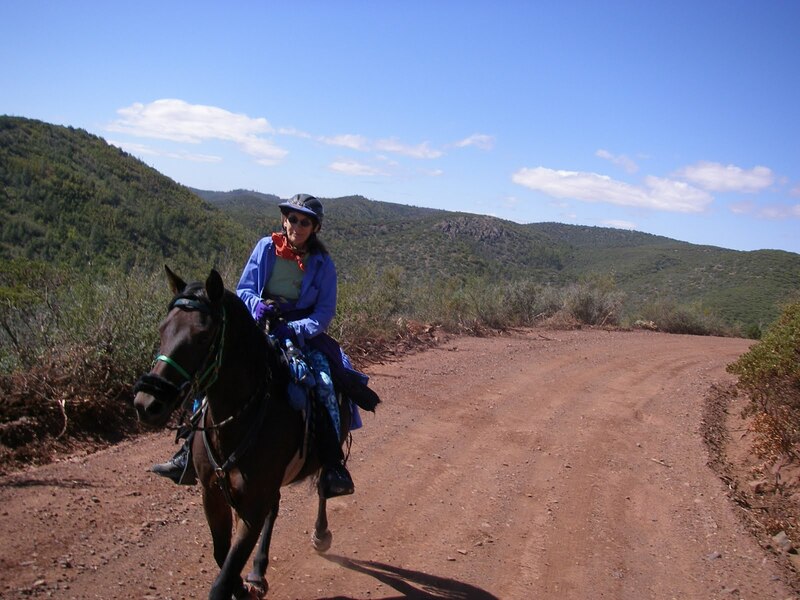 The 26th Annual Man Against Horse Race in Prescott, Arizona, marks the 5th anniversary of my foray into the world of AERC and endurance riding. This was the first AERC 25-mile LD ride I competed – and completed. As such, this is a ride that has always held a lot of sentiment to me, and it’s a ride I’ve been able to go to every year since. This year, circumstances were conspiring in such a way that it looked like we would end up missing this special ride. Part of me was feeling all right about this after last year’s attempt, as I wasn’t sure I wanted to face that mountain again. The other part of me wanted a grudge match and to redeem myself, despite my insistence that I wouldn’t. At the last minute, life pointed us in a different direction and said, “You’re going.” It was very last minute – we made the decision to go the Thursday before the ride, about noontime. The rest of the afternoon was spent trying to fit all of our ride prep into one afternoon: clean out the horse trailer that hasn’t been used for an overnight trip since June, repack the trailer, bathe ponies, load hay/water, fetch the trail home to finish packing, and pack people stuff. I’m happy to report we managed to get everything done in about eight hours, and I was still able to fall into bed at a respectable time. The nice thing about fairly local rides (just under a 3-hour drive from the barn) means that I don’t have to be up at oh-dark-thirty a.m., and can mess with fetching ice and packing up the food cooler in the morning. Dad and I are early-birds when it comes to getting to rides, even those fairly close by in our own state, and we pulled out of our driveway at 7:15, were at the barn by 8:00, and on the road again, ponies in tow, by 8:20. The trip up was the best kind – uneventful, with nothing to report. We pulled in to ride camp just after 11:00, and practically had our pick of camping spots. Camp is a large cow pasture on Fain Ranch, and part of the fun of this ride is watching the cows meander along the outskirts of where all the rigs are parked and down by the vetting area. The first Man Against Horse race took place in 1983 and was conceived by Prescott, AZ residents Gheral Brownlow and Steve Rafters. Gheral was a runner and owned a store in town. Steve was a cowboy who worked for the Prescott Police Department and enjoyed riding horses. Rumor has it that they decided to put on the race while at one of the taverns on Whiskey Row in Prescott. 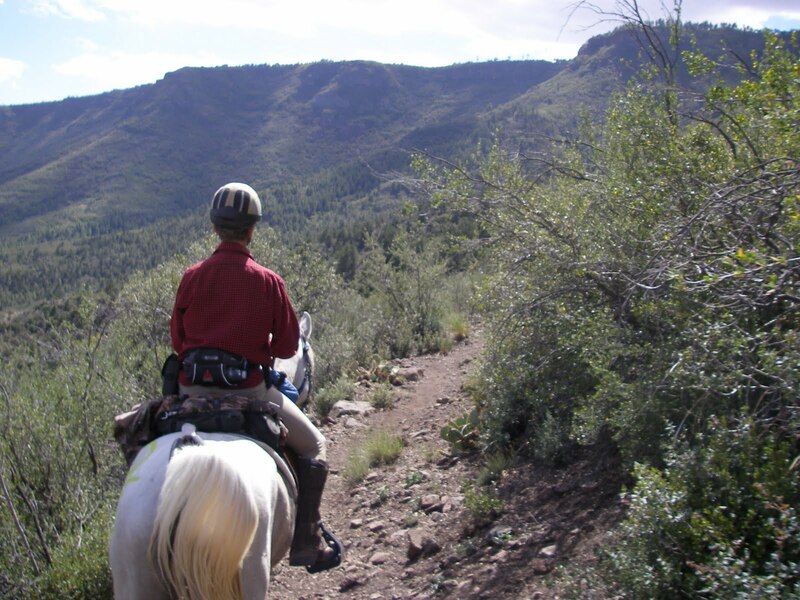 Ron Barrett, a local runner and endurance rider, became ride manager in 1988 and moved the ride from its original location at Whitehorse Lake to its current location at the base of Mingus Mountain in Prescott Valley, AZ. All proceeds and donations from the event go to support food banks in the area. Over the years, more than $100,000 has been given to feed the hungry. Thanks to Kevin Myers for the summary of the ride’s history. Man Against Horse is a very unique ride in that riders and runners compete alongside each other over the same courses. As far as I know, it’s the only event like it in the southwest. The horses really seem to enjoy sharing the trail with the runners, and quickly catch on to the idea of “chasing” after the runners. And it’s great desensitization and training for those who end up doing a lot of riding on multi-use trails. Once in ride camp, we fell into our setup routine, which went like clockwork, despite not having done a ride since February. Guess we’ve got the hang of getting our “cowboy condo” (thanks, Dad!) set up by now. We took the ponies for a walk around ride camp, and I was super-pleased to see how well they handled the rocky ground with their bare hooves. Camp set-up was interspersed with some socialization time, and getting caught up with many people I hadn’t seen in quite a few months. One of the things I really miss when I’m not doing rides is the people – I’ve made so many wonderful friends in the five years I’ve been involved in this sport. We’ve been experimenting with doing our own trimming for the past three months now, and from my completely unbiased perspective, I think their feet look really good. Every year I’ve done this ride I’ve been in boots of some sort, and every year up until now, I’ve had to have Mimi booted to even walk around camp. It was very gratifying to see her marching over the rocks without a single flinch or misstep. After camp was set up, we had enough time to go take our pre-ride, and registration and vetting hadn’t yet started, so we saddled up and headed out for an easy, couple mile stretch out from the finish line and back. This section of the trail is open cow pasture, and by taking a peek at it the previous day, I get a heads up as to any new gopher holes that might have cropped up and would be disastrous to ride over. Both ponies were really good, although Mimi wanted to keep wandering off the trail and go exploring in some of the side washes where the cows like to hang out. (Cow Pony R’ Us) After determining all their legs were still properly attached, and their brains appeared to be settled between their ears, we headed back to the trailer, socialized a bit along the way, then untacked the ponies. While they were munching, I scurried over and got us registered, and after quickly brushing the brown Prescott dust from their legs (an exercise in futility), we headed over to the vet line. We vetted through without incident, although her trot-out set what would be the continuing trend for the weekend. Mimi is called the “eggbeater” for a reason when she trots. She is 16, and has fused hocks. Her trot always looks a little bit stiff, because it is. She lacks a lot of the flexion in her hocks that would produce a smooth, floating trot, and that makes the vets look twice at her. Both in the past as well as this weekend, I’ve been very fortunate to have vets that were willing to hear out my explanation for why she moved that way, instead of arbitrarily pulling me for “funky” movement, and for that, I thank them. After vetting, it was time to go over to Kirt and Gina Lander’s trailer and pick up our new pairs of Renegade Hoof Boots. This ride also marks the fourth year of us using Renegades, and of meeting Kirt and Gina along the trail at the first water stop, and realizing they were the ones responsible for those cool new boots our vet had directed us to. At this point, I would like to pause and thank Kirt and Gina – their boots were one of the key factors in getting us through this ride. The Renegades offered fabulous protection from the rocky trails, and we were able to trot over parts of the trail we would have otherwise been forced to walk. They offered fantastic grip during the grueling climb up Mingus Mountain, including the parts that involved scrambling over large boulders in the trail. We put the boots on Saturday morning, and never once had to touch them for the rest of the ride until Saturday night after vetting out. Their feet looked fantastic – no rubs or bruising anywhere! The boots stayed in place perfectly and didn’t move or spin at all. Thank you to Kirt for taking the time to look at their hooves and give them a rasping touchup before fitting the boots. Mimi’s custom-fitted, Equithane-molded hind boots did fantastic, allowing a tiny, almost 000-sized hoof to fit securely into a 00 boot. Her feet have grown since we switched to Renegades…where she had been a 000 on her front feet as well, she is now a 00. Dad’s horse Beamer also moved up in boot size on his front hooves at this ride, from a 1 to a 2. After getting our boots, it was time for ride briefing, which was fast and informative, and we were able to get back to the trailer in good time and make a fast dinner of ravioli and Caesar salad. While dinner was cooking, I was multi-tasking, mixing electrolytes for the next day and gathering up the last of the essentials to go in the crew box. This was another new experiment: the crew box. Up to this point, we had been using first one, then two, crew bags, and I wanted to find a way to consolidate, and make things easier to carry, as invariably, one crew bag would end up being streamlined but heavy, and the other would be filled with the lighter but bulky items. In short, the box was fabulous! I could fit everything I needed in it, save for the hay, which went in a bag that got strapped on top of the box. Unfortunately, the bungee cords went on walkabout some time during transport, but not too many people tie their hay bags together with lime green shoelaces, so I was able to easily identify it. Next time, I’ll look for more of a buckle-type strap to go around the whole box. After dinner, a final stroll to the large water tanks around ride camp with the ponies, and topping off their hay bags, it was time for bed: yet another night of getting to bed at a respectable time. Not that it made much of a difference – I had a very restless night, waking up at least once every hour, drifting off only to wake up again, tossing and turning. Needless to say, I was very glad when the alarm went off at 3:15 Saturday morning. Yes, I’m an insanely early riser on ride mornings, mostly because there’s a lot of stuff I can’t do until the morning. I typically pack the crew box cooler Saturday morning, as I have a hard time thinking of what I’ll want to eat during the ride until that day. There are also the ride-only things that end up going on my saddle: extra Renegades, small pack for carrots, camera, e’lyte syringes, rain jacket, and rump rug. All of that ends up being easier to put on after Mimi is saddled, since it’s less weight to heave up over her back. Ride start was at 6:30, with a 6:15 check-in. Both Dad and I were mounted by 6:10, checked-in, and then had the rest of the time to use as a warm-up before the start. The start is situated on a double-track dirt road that dips through a small wash, climbs a slight incline, then drops down to the wash that makes up the first five miles of trail. Come 6:30, the trail opened, and we found ourselves being whisked along in the middle of the pack – right where we wanted to be. We’ve found that Beamer especially does best when allowed to start along with all the horses, versus being held back. Starting with the pack give him something to focus on – namely, the other horses – and he thinks move about moving forward than moving upward. It was one of our smoothest ride starts, despite Mimi tossing in an uncharacteristic leap of protest at being held back as we crossed through the wash at the start. 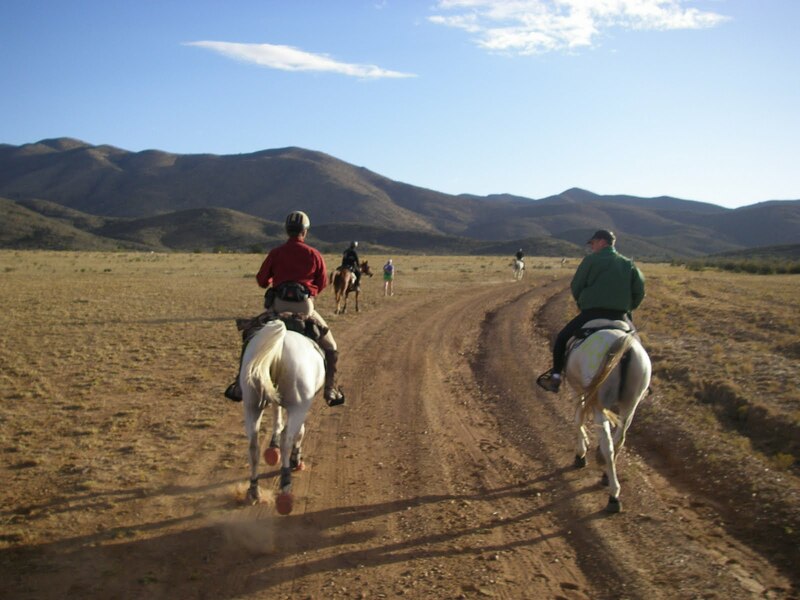 The first five miles of trail are mostly in a sand wash that is great for trotting. There were a couple of sections of rocky areas to walk through, but it seems like the wash gets shallower and more trottable every year. This part seemed to zoom by this year, despite having a few moments of “how am I supposed to go 50 miles” when, at around mile 3 or 4, my lower back started whining, my feet went numb, and my legs started wondering how long they could keep up posting. The feeling passed pretty quickly though, and my body settled back into ride mode in short order. This ride has a lot of checkpoints, courtesy of the county Sheriff’s Jeep Posse. They man the runner’s aid station and take numbers as you pass. They also generously share runner goodies with the riders, a very welcome treat. The first of these many checkpoints is at the 5-mile mark, where we stopped very briefly, split a bottle of water (that was really nice, being able to get a lot of water along the way without having to carry a ton of it on either my person or saddle), and continued on. 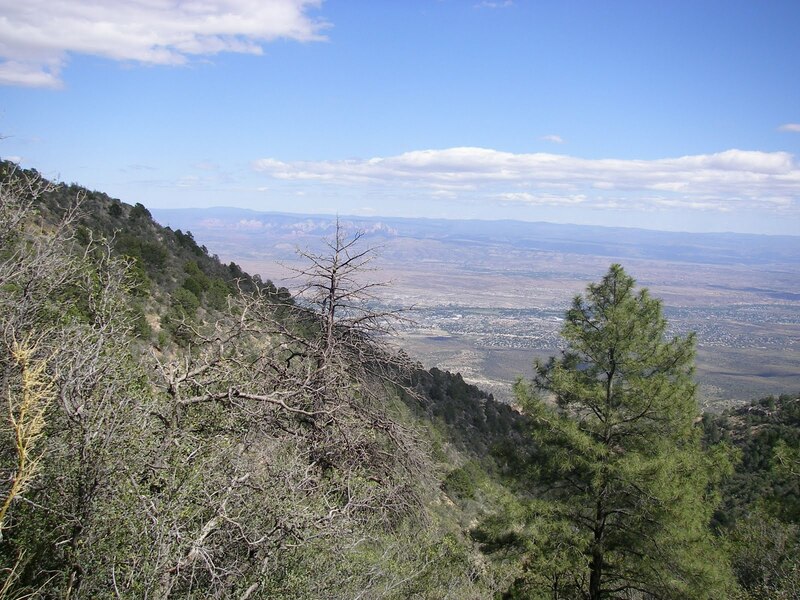 From here, the trail climbs out of the wash and onto double-track dirt road that winds across rolling meadows at the foothills of the mountains. Next checkpoint was 7 miles in, and the first horse water available. Neither pony wanted to drink, although Beamer tried to sample the algae growing in the trough. Euw. That was just fine, as there was another trough at the next checkpoint, 2 miles up the trail. 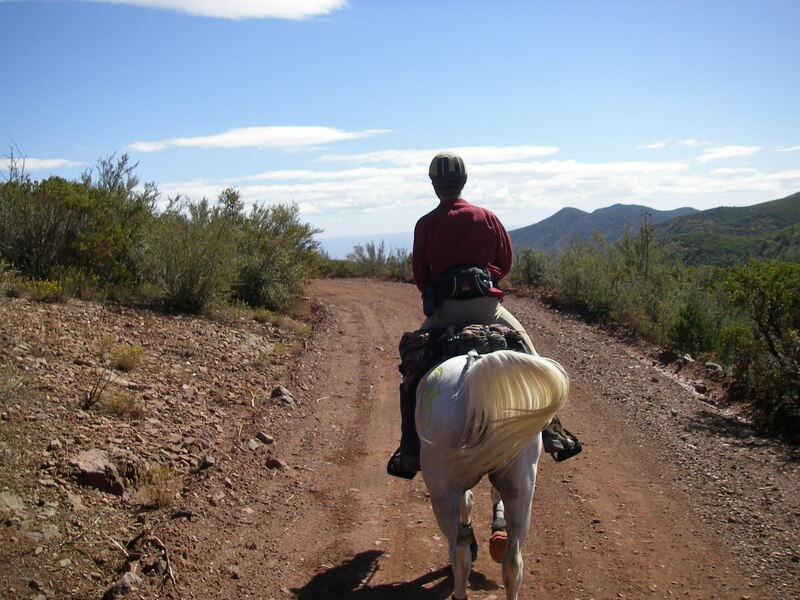 At mile 9, both ponies drank, both riders got off for a quick stretch, and then it was back on trail – the start of what is called the “Grapevine,” a single-track trail that winds up through a canyon and eventually deposits you onto logging roads that take you into the first vet check. This section is one of my favorites. 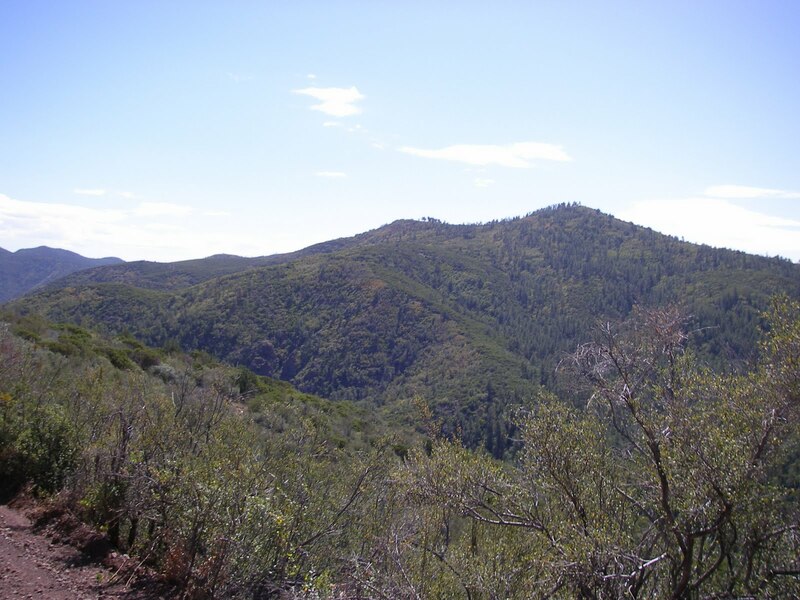 It’s a lot of technical single-track that tunnels through huge stands of scrub oak and Manzanita bushes. Definitely a good section to be wearing half chaps. Up to this point, Beamer had done the majority of leading, but now it was Mimi’s turn. She’s aces when it comes to hills, especially the kind that involve a lot of twisting, turning, and smart footwork. Her small size and compact build really come in handy on a trail like this. It’s a 7-mile climb up to VC1, but most of it is slow and gradual, so we were able to trot most of the way to the vet check. We hopped off right at the VC, walked them over to the trough and let them drink, and by the time Beamer was finished drinking, his pulse was down, and Mimi followed suit a minute later (parameters were 64 all day, I think Beamer was at 48, Mimi 60). We were probably in the check a total of three minutes by the time they pulsed down. It was here I gave up on my heart rate monitor. I haven’t been riding with it of late – my belt for it broke, I’ve yet to get another one put together. and didn’t have time before the ride to remedy that – so I carried the transmitter with me and wore the watch, thinking I could just hold it on her side at the VCs and see when she was down. I attempted this idea at VC1, and gave up when I got a reading of 90 to the pulse-taker’s 60. VC1 was a hold time of 30 minutes. After pulsing in, we immediately went over to vet in. Both vetted through great, and we found a nice, half-sunny spot to settle in for our remaining…15 minutes. Where does the time go? Dad held the ponies while I grabbed the crew box, draped fleece blankets over their rumps, and laid out pans of sloppy goodie mix, carrots, and hay. I shouldn’t have bothered with their exotic goodie mix concoctions (beet pulp, flax, probiotics) at this ride, as they only wanted hay and carrots. I also used this time for a potty break – ooo, Porta-Potty, very civilized – then traded off pony-holding duties. Dad and I each ate a peanut butter sandwich, and I amused those around me by multitasking, sandwich still stuffed in my mouth. I believe in eating on the go. The rest of the time was spent refilling water bottles, carrots in the saddle pack, and on-the-trail munchies, then all too soon, it was time to pack up the box, tighten the girths, find a mounting block, and head out…right on the dot at 9:42. The section after the VC is an old logging-type road that climbs up and down, and up and down, and up and down, drops down onto a gorgeous section of single-track that runs next to a dry streambed, then reaches the next big checkpoint at mile 20. There’s water here for the horses, and they drank again. 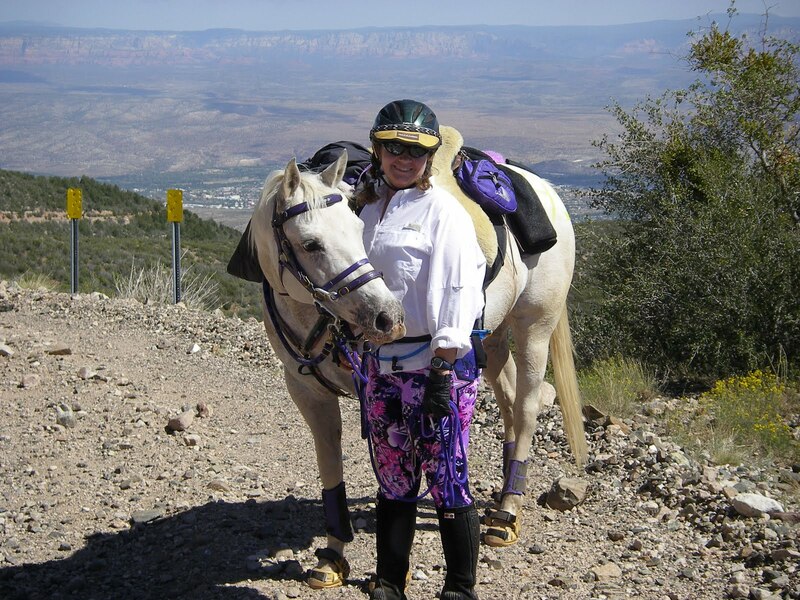 Shortly after the VC, we met up with Bobbie Jo Lieberman and her Morgan mare, Excalibur Annakate, and they would remain our riding partners for the rest of the day. All three horses paced well together, and got along with each other. There were a couple of dirty looks passed between the two mares a few times, but I consider that par for the course with mares, especially mine. The next nine miles after the checkpoint at mile 20 is a wide, forest service/logging-type road that winds around Mingus Mountain. It is a mix of being rocky, hard-packed, and pleasant. The first several miles (an approximate guess, since I don’t have a GPS) are rocky, but trottable, especially if you’re wearing hoof boots. The middle three miles are the most unpleasant – large swaths of loose rock, slabs of rock, or a combination of both. It is also out in full sun, making it the warmest part of the ride. However, with highs in the low 70s, even this wasn’t unpleasant. The view from the road is incredible, though, and in a way, it’s kind of nice to have to walk part of the way, as it allows you to take in the view. At one point, it’s possible to see all the way out to the Sedona red rock canyons, and the whole of the Verde Valley is laid out before you. The camera can’t even begin to capture the panoramic magnificence of the view. The last three miles or so of the road are really nice. The rocks seem to disappear, comparatively, and you can really fly through this last section. There are sporadically placed culvert alongside the road, though, which makes for some interesting duck-and-weave maneuvers as you go trotting past. Metal culverts = Mimi’s mortal enemy. At the end of the road awaits what most consider the toughest part of the ride: a three-mile climb up Mingus Mountain, with an elevation gain of about 1800’. (Did the little voices just start chanting, “Tevis training, Tevis training, Tevis training?”) At this point, the trail turns from road into single track, and starts moving upward. This was our lowest point last year, when, partway through the climb, Mimi slipped on a very tricky, technical section of the trail and we nearly wiped out. All of that was not helped by the fact it was really wet, muddy, and slick last year. This year, the weather was on our side, and the trail seemed to be in great shape. 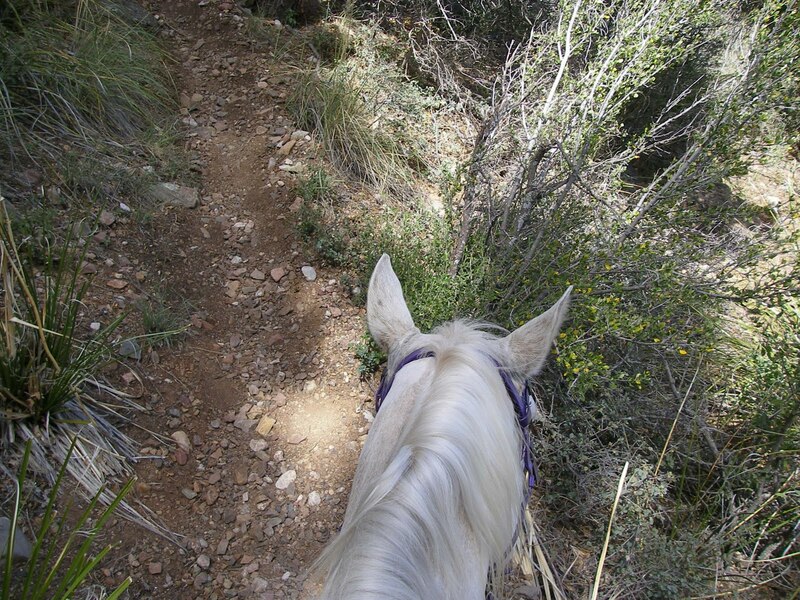 However, remembering last year, I hopped off Mimi in advance of the tough area, which involves a steep climb, sharp switchback, and immediate step up/jump (depending on your horse’s height and leg length) over a rocky ledge. She clearly remembered last year’s episode, and kindly stopped before the jump up the ledge to let me scramble ahead, then gamely jumped up after me. Good girl. We took a five minute break here in order for me to relearn how to breathe (I don’t do well at elevations) and when Mimi started pulling me down the trail again, I hopped back on to ride her the rest of the way. 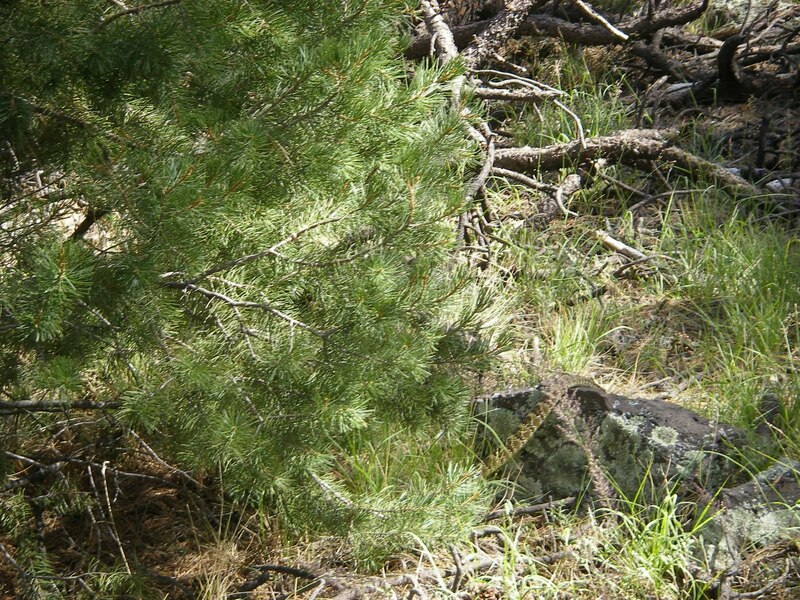 Partway up the mountain, we happened upon an unexpected trail occupant: a Green Mojave rattlesnake. Bobbie had been leading the way, with us about a hundred feet behind her. She called back to say she heard something that sounded like rattling behind her, and just about that time, the trail in front of us exploded in a hissing and rattling storm. Beamer slammed to a stop and backed up several yards until he ran into the immovable barrier that was the pony, and we watched as a large snake slithered across the trail and draped itself over a rock about five feet off the trail. After standing there for a couple minutes, trying to determine if the snake was going to keep going, or if he was settled in for the duration, we quickly scurried past him. As if climbing the hill wasn’t enough to get the heart rate going. The rest of the climb up the mountain is fairly slow-going in most places. There are a few places where you can pick up a trot and make some time, only to slow down within a couple hundred yards to pick through more rocks. It’s the climb that keeps on going – when they say you’re going to the top of the mountain, they mean the very top. Near the top, there’s one final section that involves some deft maneuvering over and through some boulders in the middle of the trail, but Mimi-the-mountain-goat scampered right through it without a hitch. Her little feet come in handy sometimes – she can use tiny crevices and spaces in between rocks as footholds, and pick her way through a tricky section, versus having to leap over a large boulder in one go. After reaching the top, it’s another mile of blissfully flat forest service road into the vet check at 33 miles . We walked this road as a chance to let the ponies cool off and stretch out after the hard climb. 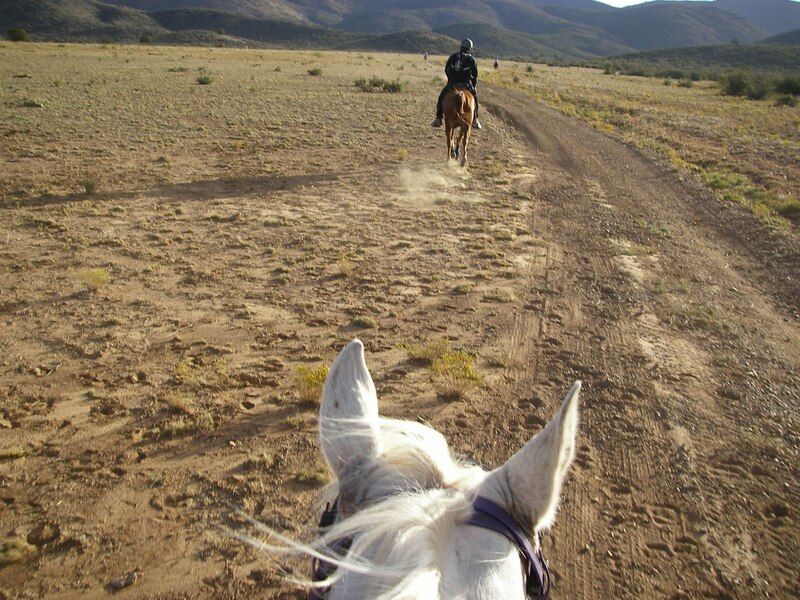 I was ultra-conservative and ultra-paranoid at this ride, as Mimi has had some problems in the past with muscle cramping, so I rode with a rump rug, and religiously whipped it out every time we stopped for more than thirty seconds. That, combined with a more aggressive electrolyting protocol, must have helped, because there weren’t any signs of some of the problems we’ve had in the past. The vetting portion of VC2 was a repeat of our check-in that involved the vets looking at her cross-eyed as we trotted out, and my heart just sank when I heard the dreaded words, “Trot her out again.” Oh, no. No, no, no. Don’t tell me we just climbed all the way up that %#*^ mountain only to get pulled. So we trotted again. My legs weren’t being the most cooperative, and the trot-out area was in a small mountain meadow covered in grass that hid a lot of dips and ruts – hard terrain to move out in, which meant we were trotting pretty slow, and the slower she trots, the funkier Mimi looks. She didn’t look any worse the second time, and even after a very thorough check up and down her legs, she wasn’t showing any signs of pain or soreness, and her heart rate was all of about 48 at this point, the vets ultimately left the decision up to me as to whether I wanted to continue. There was no doubt in my mind at this point: Absolutely! I know my pony, I know how she moves. She was moving totally normal for her, she was bright-eyed, and her metabolics were great. When she’s uncomfortable, her pulse is sky-high, or it hangs in the mid-range, and she won’t eat. Well, her pulse was down, and she was starving. I often think I over-pack the amount of feed for VCs, but this time, I barely brought enough. They decimated a flake of alfalfa between the two of them at VC1, and at VC2, they each polished off half a flake of alfalfa, half a flake of Bermuda, a couple carrots, and a few scraps of someone’s oat/grain mix leftovers. Oddly enough, neither of them touched their carefully prepared goodie mixes. And I even left the electrolytes out. VC2 was a longer hold – 45 minutes – and I used the time to feed myself and Dad, refill water bottles and my Camelbak, restock on carrots, and stuff more snacks in the saddles. All too soon, it was time to go…where does the time go at these vet checks? I don’t know how people manage to sit down and take a break at them – my only break seems to be when I pause to go take a bathroom break. Maybe it gets easier and more streamlined as you go along. Or maybe I need to start trying to wrangle people into coming to crew for me. We headed out, right on time (yeah! ), and moseyed down the trail until they were warmed up, then set off again at a nice trot. At this point, the trail starts heading down the mountain, and was a mix of forest roads and single-track. And rocks. A lot of rocks in this section, and I was so glad for the Renegades. All three of us were riding with Renegades, so were able to move out over the terrain. Five miles after the vet check, we were back at the same checkpoint as mile 20. Last year, this was where we got pulled. This year, we paused to let the ponies drink, then continued up the road at a brisk trot. This section was fun – a couple miles of forest service dirt road, and we really moved out, even letting the ponies “race” at a canter for a few minutes. At mile 40, we turned off the road onto what is my new favorite section of the ride: a 3-mile stretch of single-track trail that slowly winds down the mountain, trottable 95% of the way. Mimi led through this section, and we a had a blast! These are her favorite kind of trails, and she just zooms her way through the trees and up and down the hills. This was the section of the ride we missed last year, so I was really excited to be able to make it this year, and Mimi picked up on my excitement, since she practically bounded through here, and before we knew it, we were at VC3 – a gate-and-go style check at mile 43. At this point, the trail meets up with where the 25-milers came through after their hold at VC1, and leads home. All of our ponies had done the 25 before at this ride (Mimi three times) so they knew the way home. At the bottom of the mountain, it’s a mile of mostly-smooth, double-track dirt road, and we made up a lot of time here, although I had to stop a couple times to accommodate and give my right shin a break, since the pressure from the stirrup leather was reaching the knife-burning sensation level. Another mile on the “power line road,” a wide, hard-packed road that leads back to residential areas, and then camp was in sight. Two miles across a wide-open field, following a cow path, and we were DONE! We slow-trotted the last mile or so, then walked the last 100 yards to the finish line. Mimi had her “pony march” going, and was out-walking the “big horses” to cross the line first in our group. In her mind, she won. I know it’s not official until the vet-out, but I knew we had done it. We finished what I would consider to be one of the toughest 50s in the Southwest Region. People were still waiting at the finish line for us to come in, and as soon as I heard their applause, I couldn’t hold back the tears – of joy, of amazement, of absolute pride and wonder for my little Go Pony. She was still bright-eyed and marching, 11 hours and 45 minutes after our start, and after I dismounted, she dragged me over to the water trough to drink. I whipped the rump rug out, pulled off her leg wraps one final time, and took her over to vet out right then and there. She vetted through great, and the adrenaline from the success of finishing the trail and crossing that line was enough to motivate me to run as fast as I could for the trot-out. That trot-out score was her best of the entire ride. They were sufficiently cooled-out enough to be able to take them back to the trailer, untack them, blanket them, and leave them to large amounts of grass hay to munch. Last year, we came in so late, we didn’t get dinner. This year, we were still in time to get more than enough of the fabulous barbeque dinner: ribs, melt-in-your-mouth brisket, coleslaw, beans, and peach cobbler. And wine. A finish like this deserves celebration. The awards for the 50 milers include the coveted silver buckle for finishers…the start of my ride buckle collection! We also got hats, and the t-shirts that all participants get. After dinner, we took the ponies for a walk around camp, let them drink from the troughs, and then left them to sleep, stockpiled with a large amount of food to munch overnight. A phone call and a few text messages later to spread the word, a “sponge bath” with baby wipes, and it was time for bed. During the night, a storm front started moving in, and despite being exhausted, I kept waking up every couple hours to howling wind outside. At 3 a.m., I finally woke up, in need of Motrin…which was in the truck. I pathetically crawled out of bed and out of the dressing room, but I was glad I went outside when I did. Both ponies had eaten nearly all of their hay, so I gave them a refill, grabbed my Motrin, and went back to bed again, this time until about 6:30. Janice ~ who hopes to join the AZ gang next year! Fantastic minute by minute, mile by mile, account of this ride. I felt like I was right there with the rider/writer every step of the way. Valuable information regarding, crew bags, boots, timing, multi tasking, and horse vs man. Great story! Congratulations :) I always have trouble sleeping the night after a ride too – still too excited and I also have those half-awake dreams that I'm trotting along and the horse stumbles… disconcerting! Good luck with your endurance riding. Loved the story and the pics to go with it! I don't do endurance, but a lot of miles trail riding on my 14.1 Paint pony. Stories like yours inspire me to think about CTR and maybe more. Congratulations on your 50 miler!